Featherstone Center for the Arts looks out from one of the highest points in the town of Oak Bluffs. 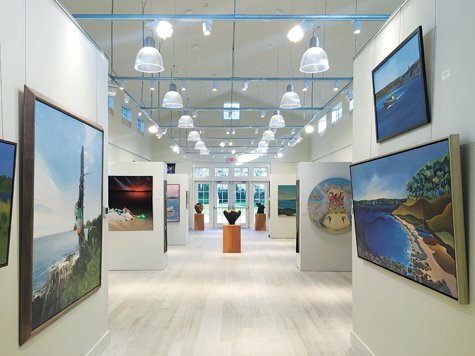 The opening of their new gallery last summer was a landmark event for this vital part of the Island arts landscape. Until the 1990s, Feather-stone was a horse farm. In its early years, the arts center transformed old barns and houses into studios and classroom spaces while the old farmhouse housed a gallery and offices. After twenty years of making do with those cozy but limited spaces, it was time for a change. In 2015 Featherstone launched a $6 million capital campaign to raise money for the construction and operation of new buildings and to grow their endowment. Thanks in part to a $2.9 million gift from an anonymous donor and efficient work by Squash Meadow Construction, the project was able to be was completed in rapid time. The contractor used a combination of on-site and modular construction which allowed them to complete the construction of two new buildings, adding 6,200 square feet of new art space on campus in just eight months. The new gallery is well worth a visit. It re-opens in February with “Dog Wild,” a show to celebrate the Chinese New Year of the Dog. Classes in drawing, painting, pottery, printmaking and more will continue through the winter and spring. Executive Director Ann Smith is very happy with the new buildings. “We love it!” she says. Landscaping is still in progress and fundraising for the project continues, with $1.5 million left to raise towards this significant campus improvement.